Hamilton's first automatics were in the Hamilton Illinois line up from the early 1950's. However, within a couple of years the Illinois brand was dropped and the Automatic K-series of watches were Hamilton's automatic offering. There were almost 60 different models (59 to be exact) and each was a little different than the others. 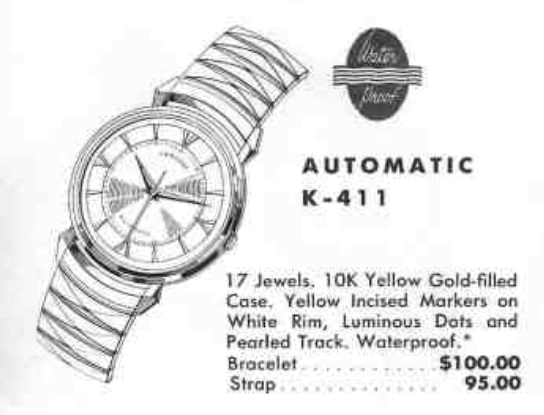 One of the models introduced toward the end of the 1950's was the 1958 Automatic K-411. It was produced for only two years. There's a lot going on with the K-411 to make it unique. It's got a 10K gold filled case with angular lugs. The dial has a silver (white) chapter ring with gold highlights at the hours. Inside the chapter ring is a textured dial with a pearlized minute track and luminous dots at the hours. Finally, luminous dauphine hands indicate the time. Like most of the K-series watches, the K-411 uses the Kurth Freres (Certina)-based Hamilton 661 movement. It's big and bulky but gets the job done. I recently received a K-411 project watch that had definitely seen better days. The crystal was cracked, the second hand was missing, the crown was gone and it was plenty dirty... just the way I like them! If you understand the nomenclature Hamilton used for numbering automatics, you'd expect a 411 to have a gold filled back. If it was a K450-something, it would have had a stainless back. As you can see, this watch has a gold filled back that screws on and off. The movement is plenty dirty but at least there is no rust inside - that's lucky since a missing crown could easily let in moisture. There are two places for case screws to secure the movement to inside of the movement ring. One of the screws is still there (shown below) but the other is missing. In this shot, you can see the spot for the other case screw is badly mauled up. Someone went at it with a small drill bit or something. Other than the ugly appearance, no serious harm was done. I can see the stem broke off with the crown - there's still a portion of it inside the movement. With the set lever screw loosened, a strong magnet draws the broken stem out of the movement. At this point, everything is broken down, cleaned and readied to be reassembled. It's all bright and shiny again. Without the oscillating weight carrier and rotor installed, the movement looks like any other manual winding movement. The train bridge takes up at least 2/3rds of the back. With a few winds to the mainspring, the balance is now swinging away, so it's off to the timer. It's running a little slow and the amplitude is on the low end (over 200 degrees is the goal). I can speed the watch up by tweaking the regulator and increase the amplitude by winding it a little more. There... that's better. Nothing too shabby about the performance now. Now it's time to apply some fresh lume to the hands and dial so it will glow in the dark again. Obviously a new crystal is needed as well. The original finish on the dial has failed but a little gentle cleaning still made it look a little better. If I were to clean it any further I would likely lose the printing and I don't want to do that. My light tent makes the watch look a little worse than it looks in person. With a brightened chapter ring, new crystal, new stem and crown, a fresh strap and refreshed lume, the watch looks great - especially compared to what I started with. Hamilton has a lot of nautical themed watches and I've always wondered the reasoning for that. It's obviously purposeful, because some nautical names were used multiple times. A good example is the 1966 Boatswain III. A Boatswain (Bosun) is the senior crewman of the deck department. When you hear someone "piped aboard" with a whistle, the whistle is a "bosun's pipe". Anyway, as you may surmise there was an earlier Boatswain and Boatswain II. The Boatswain III was introduced in 1966 and made through 1969. Like the other two Boatswain models, the Boatswain III was an entry-level Hamilton watch with a Swiss-made movement and a rolled gold plated case. It was still a fine watch but it was designed to be price competitive in an ever-more challenging marketplace. In addition to the cushion-shaped RGP case with integrated stainless steel back, the Boatswain III featured a faceted crystal and a four-markered dial so the watch sparkles on the wrist. Inside the case is a Hamilton 688 ETA-based manual winding movement. I had seen a non-working Boatswain III listed on eBay for several months and in addition to not working, it had something going on inside the crystal so I wasn't too tempted to get it. I was concerned that it might something on the dial and getting the radial-finished dial redone properly could be a challenge. However, to be totally honest, I got tired of seeing it over and over and since the price was right, I finally bought it. Once I had it in hand, I realized that the funk inside the crystal was on the crystal and not the dial - so that was fortunate. The case was exceptionally grungy. Although the case has a stainless steel back, it's integral to the RGP bezel so the watch opens through the front by removing the crystal. Here's another shot of the grunge. I should be able to clean this up fairly well though and a little elbow grease will make a huge improvement. Without the crystal in the way, the dial actually looks fantastic. The movement is very clean looking. I don't know why it's not running but at least it's not corrosion-related. Hopefully a good cleaning will do the trick. Everything is taken apart, cleaned and set out to dry. This ETA movement is similar to the ETA automatics that are based on the same basic design. The most tricky part of putting it back together is to get all four wheels to line up with the train bridge. I do that without the pallet fork in place - so the escape wheel is free to move as I tweak it in place. You need to look at the wheels from this angle while you gently prod the various wheels into their respective jewels. When everything lines up the bridge will drop into place. No force at all is needed and if it doesn't drop into place, you know something is not aligned properly. Forcing it down will just break a pivot and then you're screwed. The rest of the parts go back on and the now-running movement goes onto the timer. Based on the noisy pattern, something isn't right with the balance. Even the slightest piece of lint or dust will throw the timing out of whack. It is truly fascinating that a timer can "hear" this noise. Cleaning the hairspring and running it through the demagnitizer seemed to speed the watch up but there's still something not quite right. "Once more unto the breach..." I had to remove the balance again and give it a good cleaning. Upon very close inspection I saw a tiny filament of lint on the roller table... too small to photograph but big enough to cause problems. Once I removed that, the watch began to run properly. A slight tweak to the regulator slowed the timing down so that the two lines run horizontally. There are no watchmaker marks inside the case. I bet one reason this watch was a non-runner was simply because no watchmaker has opened the case since it left the factory almost 50 years ago! A gentle polishing of the case and crystal makes this watch look almost new again. A nice black lizard strap completes the restoration. I bet if I put this watch on eBay now, it wouldn't stick around for very long - its a real beauty. One of the more popular watches from the 1950's is the 1955 Clark. This is probably do to it's rather extreme shape. The most obvious element of the 1955 Clark is the sharply pointed lugs. Paired with it's correct bracelet, you can see how a lot of thought went into what style of bracelet complemented each unique Hamilton model. When I look at the Clark, I think it looks somewhat diabolical. 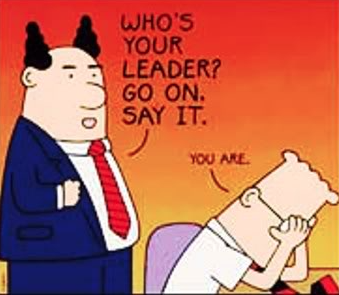 In fact, it reminds me of the sort of watch to wear on boss's day to give yourself a chuckle. The 1955 Clark is the second model to bear the name and was produced for three years. The first Clark was issued in 1936... almost 20 years earlier. The 1955 Clark was initially introduced with a the 12/0 sized 19 jewel 753 movement but later that year probably received the soon-to-be-introdcued 22 jewel 770 movement. So if you see a Clark with a 770, it's most likely a 1956 or 57 model. The 770 was a dramatic improvement to the Hamilton line. The US-made movement was marketed to have 5 key features... 22 jewel, fully adjusted, shock resistant jewels (for the balance staff), anti-magnetic and a lifetime-rated Dynavar white alloy mainspring. I recently picked up a nice Clark project watch from another collector. I could a really good deal on it, so I consider it to be an early Christmas present. As received, the only real issue with it was the crystal had some small chips along the edge and in a corner. The 10K yellow gold filled case is in very nice condition although the inside of the case back is missing a lot of the gold. It's not a plated case but I guess the gold content is less on the inside of the case back than the outside, which would make sense. The dial has already been refinished. It looks great. The only obvious tell from the from front is the tiny notch by the 3 (you can barely see it in the photo). The back of the dial has some numbers scratched in - that the best way to spot a refinished dial. Refinished dials are not a big deal for Hamilton watches, as long as they are done with the correct printing and pattern. The value of other high end European brands is heavily penalized when the dial is redone - even if done well. But for Hamiltons, a nicely redone dial can often be preferable to a so-so original dial. It's a bit of a judgement call, really. The 753 looks a lot like a 770, it's just missing the cap jewels that you'd find on the fourth wheel and third wheel of a 770. Everything is disassembled, cleaned and readied for reassembly. The reassembled movement goes onto the timer. It's running about 3 minutes fast per day with good amplitude and a beat error on the high side but still acceptable (in my book). If it was easy to correct I would do so, but it would require several attempts to get it much better and each attempt is risky. A minor tweak to the regulator is all that is needed to bring the beat rate right in line. You can see how the two lines on the timer make their way toward horizontal. With the movement cleaned and oiled, all I need to do now is get a new crystal. The strap that came with the watch was new and looks great. 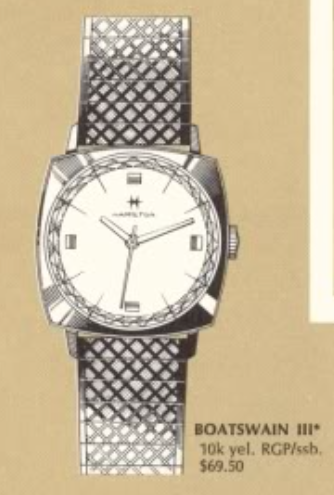 You may have picked up the impression that Hamilton typically named it's watch models after peoples' names... mens or ladies, depending upon the intended gender of the model. Up until the introduction of automatics, that was largely the case - including dress pocket watches - they all got a man's name, with a few exceptions of course. By the mid 1950's there were a number of repeat uses of the same name and although there are plenty of common names that were not used (like Daniel, for one) Hamilton introduced some names there were real head-scratchers. 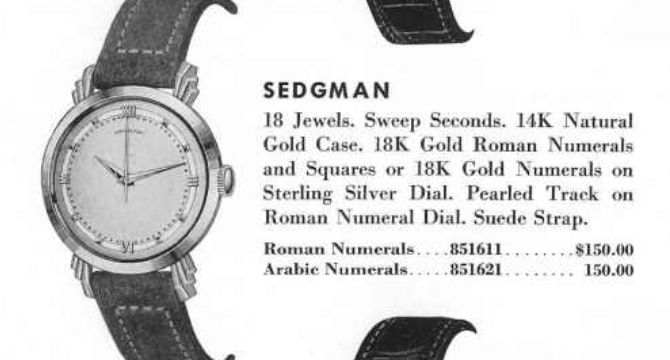 A good example is the 1953 Sedgman. It was produced in 1953 and 1955 but appears to not have been made in 1954... go figure? I wondered where Hamilton got the name Sedgman from and a little sleuthing revealed that there was very popular tennis player in the 1950's by the name of Frank Sedgman. In the five-years between 1948 and 1952 Sedgman won 22 Grand Slam titles in singles, doubles, and mixed doubles - not bad for an Australian (ha ha - sorry Roger!). I'd be willing to wager that was the rationale for the name but that's purely a guess on my part. Anyway - it's interesting that it was made in two out of three years. There are a couple of other models that did that - but not too many. In 1953 it came with a choice of two dials... an all numeral dial or a two-tone white / butler finished silver dial with solid 18K gold roman numerals and markers. The Sedgman was also featured in the Christmas catalog from the same year. Then in 1955, both dial options were presented. The all-numeral dial looks a lot like the all-numeral dial used in the Rodney. 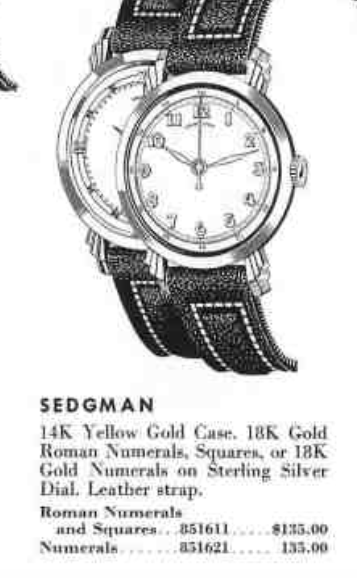 In fact, the shape of the lugs is the main way to tell a Sedgman from a Rodney - that, and the fact that the Sedgman comes in a solid 14K yellow gold case. The Sedgman is a good example of the evolution of Hamilton watches to a larger size than the prior decade. 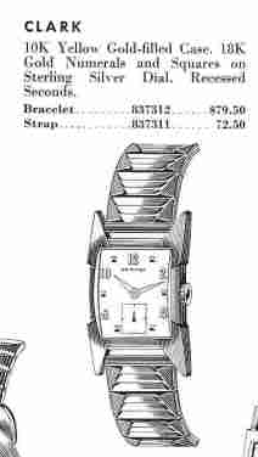 There are a number of watches from 1953 that a significantly larger than watches produced previously. I recently picked up a Sedgman project watch and it arrived in better shape than I expected. The crystal was due for replacement and the only other distraction was a very worn crown. Otherwise it looked very promising. The case back is unengraved and not overly worn. Without the bezel and crystal in place, you can see the dial is in good shape. There are a lot of details on this dial with the markers, two-tone finish and pearled track. It could be refinished but it would be tricky to get all the details correct. The Sedgman is outfitted with an 18 jewel 8/0 sized 748 movement. You might see a 735 inside if it was a late enough 1955 model. I'm going to guess that this is a 1955 model as well, because this 748 doesn't have a serial number. The stamp inside the case back makes identifying this model very easy. This view looks a lot like a Rodney as well. Everything is thoroughly cleaned and ready to be put back together. The running movement goes onto the timer to see how it's performing. The gold layer on the crown came off in the ultrasonic, leaving a ring on the stem. It's not unusual to lose the gold from a crown once the knurling is worn down. I was going to change out the crown anyway. It started out running a little fast, as you can see by the upward slope of the two lines on the left side of the screen below. You can see the slope of the two lines approach horizontal as I tweaked the regulator slightly to lengthen the hairspring and slow the watch down. I tend to leave watches running a little fast initially as they tend to slow once everything settles down. The best way to remove or install a crown is by gripping the stem with a pin vice. It's best to grip the stem by the round hub so you don't accidentally break it by turning the crown too hard. The crown just screws on and off but the trick is to get the stem the right length so the crown is in the correct position when then movement is reinstalled. With a new crystal, new crown and a fresh genuine lizard strap, this Sedgman is looking as great as it runs. Other than a single tiny age spot just above the VI marker, the dial is in excellent shape. This watch is a great addition to my very small collection of solid gold models.